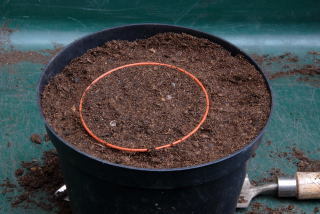 For this operation to run smoothly it is a good idea to grow your plants in pots of the same size. 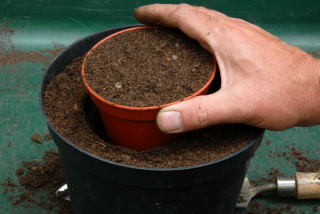 Take an empty flower pot of the same size as the plants you are about to transplant and fill it with compost. 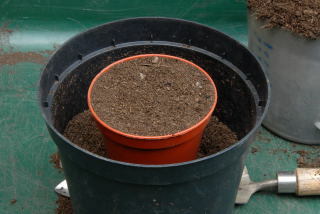 To the larger pot, add a layer of compost so that when the smaller pot is placed on the compost the rim of the smaller pot is slightly below the rim of the larger pot. Cover the whole thing in compost. 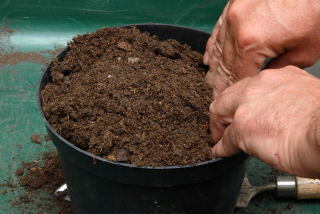 Firm the compost round the edge of the smaller pot using your fingers. You should now be in this situation. Carefully remove the inner pot. 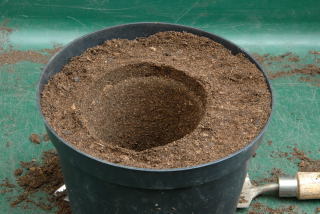 You should now be left with a perfect hole in which to re-pot your plant. 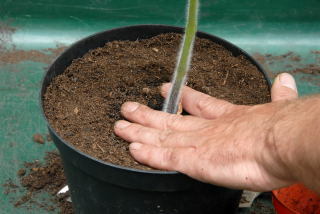 Remove the plant that requires repotting from its pot. Hold the plant by its stem and lift it up a little. 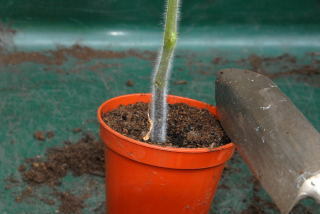 Tap the rim of the flower pot with a trowel and the pot should fall away easily. Pop the plant into its new container. 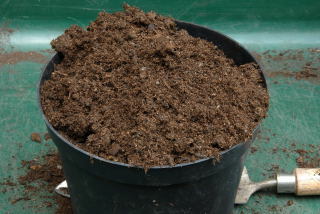 Give it a little bit of a firm so that it is in good contact with the new compost. Water it and you are done. 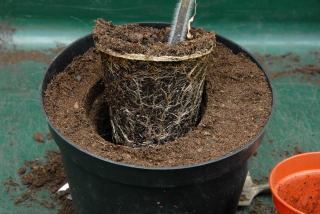 The main advantage of this method of repotting is that it is much less fiddly than trying to get the compost down the edges of a growing plant. It avoids getting compost all over the plant. You are less likely to get stabbed repotting spiky things.